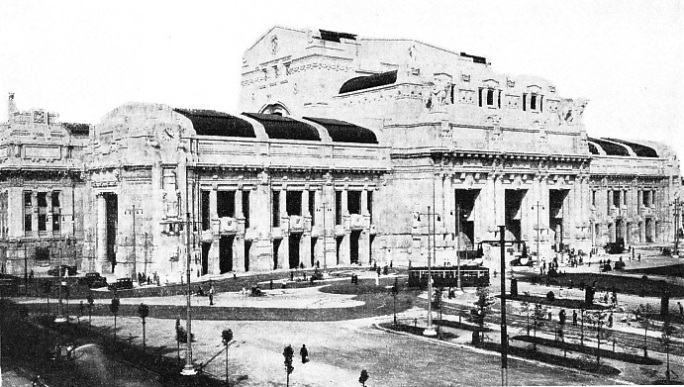 THE MAIN FAÇADE and entrance of the Milan Central Station. The façade is decorated with a colonnade 607 ft long, and 90 ft in height. The building looks on to the Piazza Andrea Doria, one of the largest squares in Italy. An area of 103 acres is occupied by the station. MILAN is the commercial and industrial capital of Italy. As the centre of a highly industrialized territory, and at the same time of one of the most fertile districts in Europe, it was predestined, by its geographical position, to become a great railway junction where through trains could converge from all corners of Europe. Milan had long required adequate facilities for dealing with millions of passengers and with the vast goods traffic. Before the war of 1914-1918 plans for the reorganization of the station and its approaches had been passed by the State Railways Administration. The vast programme comprised the construction of a new central station for passenger and express goods service, the layout of a new marshalling and goods yard, the construction of a new locomotive depot, various new junction lines, and subsidiary goods stations. During the war, and the years immediately afterwards, nothing was done, and it was only in 1925 that work was begun. 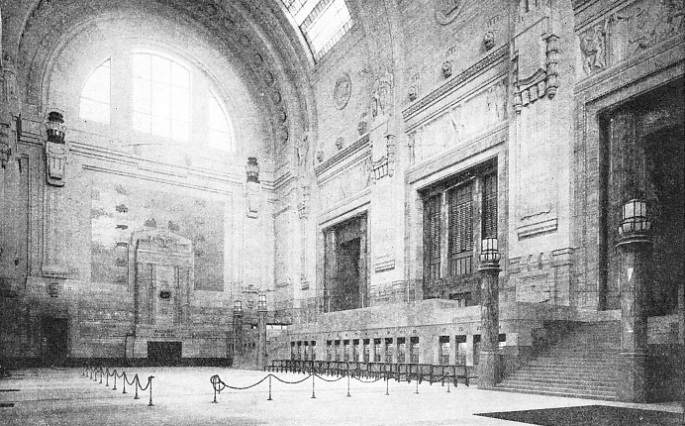 As a result, the new Central Station was opened on July 1, 1931. Travellers from all over the world have judged the Milan terminus to be the most magnificent railway station in existence. The splendour and wealth of its decoration, together with its imposing size, make it an object well worth a place among the railway wonders of the world. Milan Station is the largest in Europe. It covers an area of over 103 acres, more than four times as much as that of the largest railway station in Great Britain; the fine bay roof is second only to that of Leipzig, which is the biggest in Europe. Milan Station comprises the station buildings, the track layout, 25 ft above the level of the street, and the express goods depot, constructed at street level below the platforms. 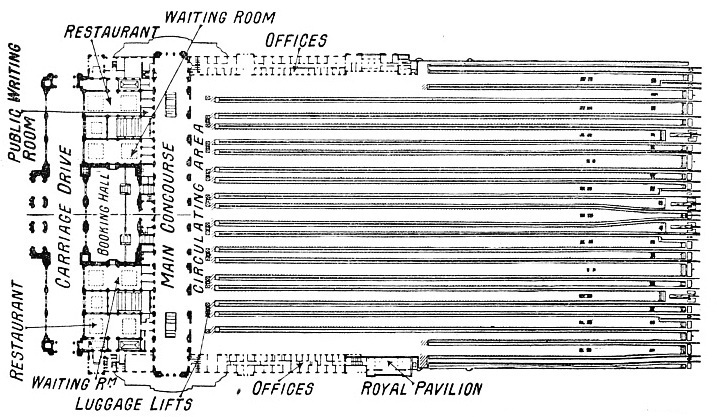 A PLAN OF THE STATION showing the various arrangements on the platform level. The station building is horseshoe-shaped and consists of a main block and two wings 500 ft long extending towards Via Sammartini and Via Apporti. The building faces the Piazza Andrea Doria, one of the largest squares in Italy. Piazza Andrea Doria is large enough to contain St. Peter’s Square in Rome. The façade is adorned with a stupendous colonnade, 607 ft long, 79 ft wide, and 90 ft high. This colonnade is reserved for vehicular traffic; to prevent any congestion, the carriage-way is divided by a broad, raised footway running across its centre into two sections for incoming and outgoing vehicles respectively. The projecting central portion, forming the portico, is designed merely for effect; with its three huge portals, 29½ ft wide and 53 ft high, it gives an imposing aspect to the whole façade. The statuary groups on top of the portico are remarkable for their beautiful conception and execution. The carriage-way receives tight through the glass roof and through the wide front windows. 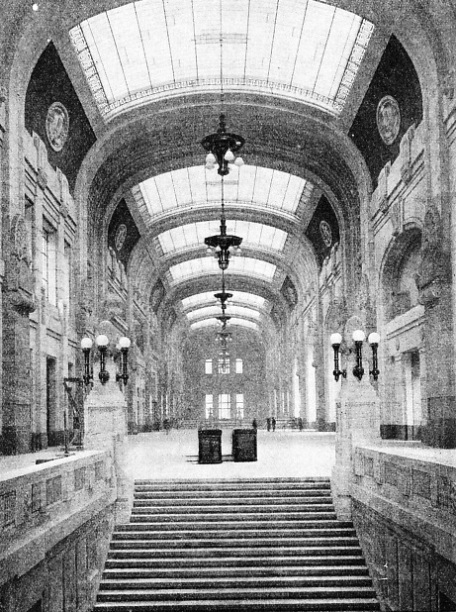 Adjoining the carriage-way is the large and magnificent booking hall. It has a length of 209 ft, a width of 110 ft, and a height of 138 ft. The hall presents a striking appearance with its glass-covered roof, its leaded windows, its wealth of many-hued marble, its grand staircases, and its sculptures. The lower part of the walls is lined with green Roia marble, while the upper part is laced with mellow polished travertine - the famous building stone used for the Colosseum, St. Peter’s, and other renowned buildings in Italy. The decorations are few and restrained; their purpose is to break the vastness of the walls, and to set at rest the mind that loses itself in the seemingly endless space. THE BOOKING HALL. This striking interior presents a majestic appearance. It has a length of 209 ft, a width of 110 ft, and a height of 138 ft. Twenty-four ticket offices are situated along the wall facing the main entrance. Six panels beautifully sculptured in relief are fitted into the walls, to enliven the otherwise monotonous effect of the long polished surfaces. The panels represent famous episodes from the history of Rome. The huge candelabra flanking the staircases are of an especially striking design. The twenty-four ticket offices are situated along the wall facing the main entrance, between the two staircases. At either of the narrow sides of the hall are passenger lifts. Two luggage halls, each of 148 ft by 49 ft, are situated at either side of the booking-hall. Here also the walls are faced with Roia marble and polished travertine. On one side of the hall the incoming, on the other outgoing luggage is handled, so that no confusion can arise. Powerful luggage lifts convey the luggage to and from the luggage halls to the platforms. The above-mentioned staircases, 46 ft wide, lead to the main concourse, a spectacular construction which resembles a gigantic arcade. This has a length of 705 ft, a width of 72 ft, and a height of 82 ft. It is lined with rose-coloured Baveno granite, and covered by an arched roof in travertine with big skylights. On one side are the large waiting-rooms, with a special waiting-room for invalids, a magnificent restaurant for first and second class passengers with cafe and bar, and another restaurant for third class passengers. Post and telegraph offices, bookstalls, a Tourist Information Bureau, the offices of the International Sleeping Car Company, a money-changing office, and florists’ shops are also housed here At either end of the gallery a wide marble stairway leads direct to Via Sammartini and Via Apporti, newly-built roads which have a width of 130 ft. On the side facing the waiting-rooms are the control gates giving access to the circulating area. 40 ft wide, which leads to twenty-two passenger platforms. Each platform is 24 ft wide; on the other side of the line it serves there extends a service platform, 13 ft wide. These service platforms are reserved exclusively for the transport of luggage and for auxiliary services such as the changing of accumulators, the inspection of brakes and axles, and the supply of stores to the dining- and sleeping-cars, and the handling of the mail. This arrangement of two separate platforms has been adopted for the first time in Italy at Milan. The advantages of having two platforms are obvious, both for the comfort and safety of passengers, and for the service itself, which is no longer hampered by a multitude of travellers. At the end of each service platform (towards the main concourse). luggage lifts are installed, while at the other end lifts for mail-bags and parcels provide direct communication with the postal service gallery. This has been arranged underneath the platforms, and it is connected, by a tunnel below Via Apporti, with the Main Sorting Post Office built on the other side of the road. The length of the platforms is 1,051 ft, with the exception of two at either side, which start at the extremity of the wings, and are only 591 ft long. Imposing in its size is the platform roof, which covers an area of 80,000 square yards. The roof is composed of five bays of three-hinged steel arches. The centre bay has a span of 236 ft, the span of the bays at either side is 147 ft, and that of the two outer bays is 39 ft in the part confined by the wings, and 69 ft beyond them. 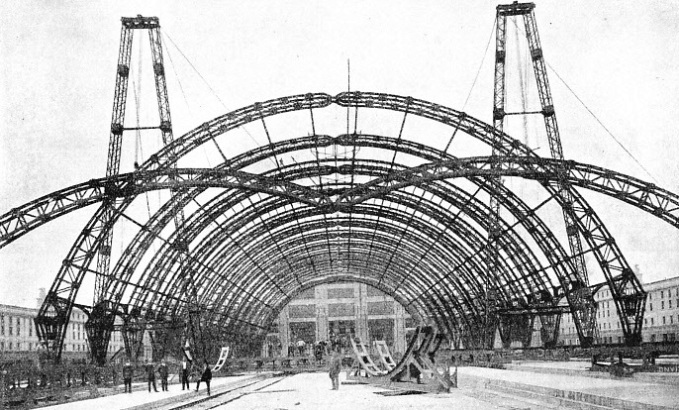 The total weight of the steel structure is 9,400 tons, each single arch of the centre bay weighing eighty tons. The arches rest on thick steel plates, placed upon granite bedstones 32 in thick. These granite blocks measure 3 ft 3-in by 6 ft 6-in in the centre bay, and 3 ft 3-in by 5 ft 7-in in the other bays. The total length of the roof is 1,120 ft. The height from the platform to the crown is 110 ft in the centre bay: 72 ft 3-in in the side bays, and 37 ft 9-in in the outer bays. Almost half the roof is covered with glass panels, the remaining part with reinforced concrete slabs. Ventilation is provided by two series of glass covered lunettes, while smoke uptakes at the crown of the arches have been installed. In the side bays a number of electric fans draw the smoke upwards through the uptakes. THE MAGNIFICENT APPROACH TO THE STATION. The roof is composed of five bays of steel arches. The huge centre bay has a span of 236 ft. All the main lines run straight into the station, four of them being for trains departing and four for arrivals. The longest platforms measure 1,051 ft. The wings of the building contain, at the platform level, on the side of Via Sammartini, the offices of the station-master, all other administrative offices, the central train control office, stores, and other accessory services. The wing facing Via Apporti contains, in the section nearest the central block, offices of various services, and, in the other section, the Royal Pavilion. This forms an annex by itself and is a particularly fine and noble construction in the classic style. An idea of the imposing size of the station building may be gathered from the following figures. The building has a volume of thirty-four million cubic feet, and in its construction the following quantities of materials were used: 4,000,000 cub. ft of masonry work, over 1,500,000 cub. ft of concrete, 3,100 tons of steel for reinforced concrete, 1,870 tons of steel for the skylights, 20,000 tons of Nabresina stone, 34,000 tons of artificial stone, and 2,400 tons of travertine. Of particular interest are the Rawie Patent movable buffer stops at the end of each line. This efficient arrangement consists of a buffer coupled to a series of interconnected sleepers, which rest upon a concrete bed. When the buffer stop is in its normal position the sleepers are lying close together. They are connected with one another by articulated steel bars. When the first sleeper is pulled by some outside force it opens the articulated bars connected to the second sleeper, until these are fully open, then the second sleeper will be pulled and moved forward, opening the bars connected to the third sleeper, and so forth. This movement might be compared with that of a concertina. Now, should a train strike the buffer head (which is strong enough to withstand the first shock), the whole buffer is pushed forward by the engine and slides over the concrete bed, pulling the first sleeper, which, as explained, pulls the second sleeper, and so forth, until nearly all the sleepers are spread out with the drawn-out bars in between. THE MAIN CONCOURSE, which is 705 ft long, 72 ft wide, and 82 ft high. It is decorated with rose-coloured granite and polished travertine. The concourse gives access through control gates to the 40 ft wide circulating area which leads to twenty-two passenger platforms. On the left are waiting-rooms and restaurants. At the first impact, the braking force is comparatively small, but it increases rapidly, as each sleeper is brought into play. The friction between sleeper and concrete bed is by itself a considerable one, and it is increased enormously by the weight of the locomotive, which bears on the sleepers. During the tests made after the installation of the buffers, a train weighing four hundred tons was run into the buffer at a speed of twelve miles an hour, and was brought to a standstill within 36 ft, and, what is of utmost importance, without the slightest damage being done to the locomotive or carriages or to the buffer itself. The lay-out of the lines has been very well planned. All the main lines run straight into the station, four main lines being reserved for incoming and four for outgoing trains. The carriage and marshalling sidings are divided into three distinct groups, namely, the Eastern, the Western, and the Central groups. This latter occupies the space at the end of the track lay-out, and is equipped with an electric traverser, and a repair shop for running repairs to carriages. The central group is surrounded by a circular line, which provides connexion with the lines to and from the Lambrate M arshalling Yard and goods station to the East, also with the Musocco goods station to the West. Conflicting movements over other lines are avoided by burrowing junctions. The central group contains nineteen lines, of which eleven have inspection pits; and it is used for the marshalling of the fast trains and the cleaning of the many trains deluxe of the International Sleeping Car Company, which has a large depot in this section. The Western group of sidings is used for sorting and cleaning of slow passenger trains serving Turin, Domodossola, Luino, and Chiasso; while the Eastern group deals with the trains to and from Verona, Brenner, Venice, Genoa, and Bologna. The platform services have been arranged in such a way that the middle group is used exclusively for the arrival and departure of long-distance express trains, the Western platforms for the trains going North and West, and the Eastern platforms for traffic to the East and South. To facilitate shunting operations still further, a double cross-over connects all the platform lines with the sorting sidings. An unusual feature of the lay-out is the provision of two special locomotive lines which connect the Locomotive Depot at Greco over the loop line at the extremity of the lay-out with the Western and Eastern groups by means of burrowing junctions. A MASSIVE STEEL SUPPORT for the central arch. The total weight of the roof structure is 9,400 tons; each arch of the centre bay weighs eighty tons. Water supply is ensured by two pumping stations at the extremity of the station lay-out and at street level at the back of Viale Brianza. The capacity of the former is 1,100,000 gallons per day. Three concrete water towers are fed by the 12 in. diameter main conduit which also feeds through a number of subsidiary pipelines the hydrants, stand pipes, and water cranes. Special attention was paid to the problems of heating the vast building and of pre-heating the trains. For this purpose a central-heating station has been constructed in Via Sammartini containing four vertical water-tube boilers with Taylor grates, economizers, and Pratt induction chimneys. A special siding connects the heating plant with the station lay-out, for the purpose of allowing coal trucks to run alongside the discharging plant, which operates automatically. The trucks discharge the coal into eight hoppers, below which an endless conveyer belt brings it to the crushers. On emerging from these, the coal is brought by elevators to a second conveyer belt, which carries it to the hoppers above the boilers. The station building and all other buildings are heated by radiators, except the Royal Pavilion, the booking hall, luggage rooms, rest-aurants, and cafes which are heated by purified hot air generated in a special plant in the basement of the main building. At night the station is illuminated by powerful floodlights, which are installed on eight latticed towers, 105 ft in height. The lighting has been designed so as to prevent lateral shadows being thrown by the rolling-stock, and special care has been taken that the lighting should not interfere with the signals. The platforms are illuminated by vertical projectors fixed at the crown of the arches. Similar to everything else in this station, the illumination has been planned on a grand scale. To arrive by night at Milan is probably the finest experience of its kind that can be had in Europe. AN IMPRESSIVE SPECTACLE is made by this view of the approach to the great station at night. The station lay-out is illuminated by floodlights, while vertical projectors at the crown of the arches light up the platforms. The signalling system is of the Westinghouse all-electric interlocking type. Five signal boxes (C, D, E, F, H), each with one interlocking machine, and two boxes (A and B), each with two interlocking machines, regulate the intensive traffic. Boxes A, B, and C are in charge of the train running, while the others regulate the sorting and cleaning sidings. The train running control is centralized in Box A, which transmits orders to Box B, in charge of fifteen lines, and to Box C, in charge of seven lines. The interlocking machine in Box C has 220 levers, and operates apart from its proper traffic all the signals of the signal bridge close by. Box A has one machine with 200 levers for operating the points and the home and departure signals of the fifteen main lines assigned to it; and a second machine of 180 levers for controlling the traffic in its zone. Box B has one machine with 180 levers for operating the points and the home and departure signals of the main lines, while another machine of seventy levers controls the traffic of this zone. Boxes D and E have seventy levers each, F has a hundred, and H fifty. The total number of levers is 1,140, by which 586 points, 227 dwarf signals, and 105 semaphore arms are operated. Signals and points at Milan station are operated by direct current at 110 volts. We have so far described the station building and the lay-out which, as already mentioned, is 25 ft above the level of the street. One of the main reasons for this elevation was that the occupation of so vast an area at street level would have meant a complete separation of one part of the town from the other. A number of important thoroughfares, such as Via Pergolesi and Viale Brianza, would have been blocked, and the building development of the adjacent zones hampered. By constructing the lay-out high above the street level it became possible to maintain the continuity of the streets by means of tunnels below the platforms. At the same time the area at street level and below the platforms is used for a subsidiary station reserved for the very considerable fast goods traffic, and for the sorting and dispatching of the mail. This subsidiary station is laid out between the wings in a longitudinal direction, and between Via Pergolesi and Viale Brianza in a transverse direction; the distance between these two main roads being 1,018 ft. The whole construction is in reinforced concrete. When we consider the enormous weight of the platforms above, including the trains, which the roof of this subsidiary station has to carry, we can well imagine the dimensions of the concrete pillars supporting the concrete girders, some of which have a width of 7 ft.
ON THE STREET LEVEL. This interesting diagram shows the details of the construction of the Milan Central Station on the ground floor. The loading and unloading lines are parallel to the platforms of the main station above. Communication between the two stations is effected by means of two electric wagon lifts, 36 ft long, and of a capacity of forty-five tons each. The loaded wagons are brought into these lifts from the different lines by the use of two electric traversers, each of the capacity of fifty-four tons. At either side of the station there are lines which are carried beyond Viale Brianza through tunnels built in the embankment of the main station lay-out. On emerging from the tunnels, they join the loop line beyond the main station. 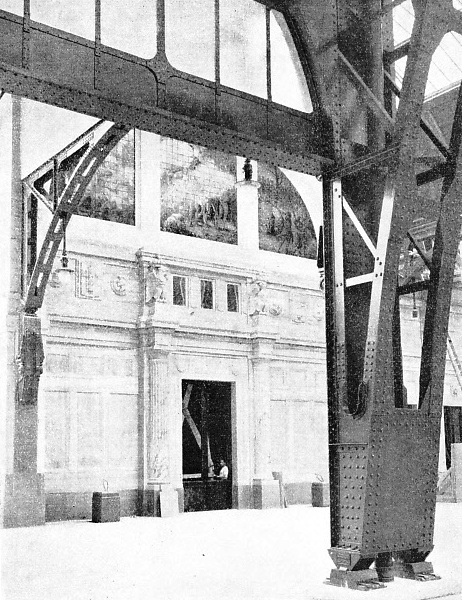 In that part of the station adjoining Via Ferrante Apporti a parcel-post office has been installed, which comprises a large sorting hall, a special hall for incoming parcels liable to duty, custom house, offices, and so forth. Outgoing parcels are loaded here direct into the mail vans, which are conveyed by the traversers to the lifts and brought to the platforms above. There they are attached to the respective trains. Below the parcel office a mail sorting office has been installed in the basement; this is connected by a tunnel, underneath Via Ferrante Apporti, with the great sorting office built on the opposite side of Via Ferrante Apporti. The entrance to the goods station is in Via Sammartini. On this side large courtyards have been built, one for incoming, the other for outgoing traffic. The receiving and dispatch offices are installed here, as well as special dispatching rooms for newspapers, various accessory services and storage rooms for perishable goods. Many other services are housed in the basement of this subsidiary station. We find here, besides the hot-air generating plant already referred to, an electric transformer sub-station, a garage, a number of comfortably furnished mess-rooms for the start, rest rooms for the guards, waiting-rooms for emigrants, toilet and wash-rooms for the staff, waiting-rooms for troops in transit, and large storage rooms for express goods. There are also several subways connected by lifts with the main station platforms, and special subways for the conveyance of the mailbags and postal parcels. The whole basement is traversed by a gallery leading into another gallery, running parallel with Viale Brianza and communicating with it. The construction of this longitudinal gallery shows the care with which even the smallest details of the station have been planned. The gallery provides direct access from Viale Brianza to the stores of the restaurants and cafes, so that all services connected with these are carried out unseen by the public. It connects, also, with the service entrance of the “Day Hotel”, which is placed below the booking hall. “Day Hotels” are found in every large town in Italy at the stations, as well as in the centre of the towns; they are for travellers staying only a few hours. The day hotels contain bathrooms, toilet-rooms, barber’s shops, quick-cleaning and pressing service, writing-rooms, shops, telephones: in short, everything with the exception of sleeping accommodation which a traveller may require for his comfort without having to put up at an hotel. The “Day Hotel” is connected with the station building by a staircase leading into the colonnade. A description of Milan Station would be incomplete without referring to the Locomotive Depot at Greco, which forms an integral part of the station. The depot is situated about two and a half miles north of the station and, as mentioned before, it is connected therewith by two special locomotive lines. The depot can accommodate 150 locomotives. The main building is a concrete structure covering an area of 65,000 square feet. The repair shop is equipped with powerful electric cranes, every kind of machine tool of the most modern type, smithies, electric furnaces, complete plants for electric and oxy-acetylene welding, hydraulic lifts and everything required for executing heavy repairs. At either side of the main building is a running shed covering an area of 30,000 square feet where running repairs are executed. Between the main building and the running sheds electrically operated traversers are installed. There are two turn-tables, the larger one, with a platform 69 ft long, is operated by a compressed-air motor. Two powerful coaling plants of the Schilhahn type allow the simultaneous coaling of two engines. The coaling plants are connected by an aerial ropeway with the coal depots in the immediate neighbourhood. At one end of the lay-out a large building has been constructed containing offices, the engine drivers' school, the library, a large lecture hall and a reading room. Another building has staff accommodation rooms. 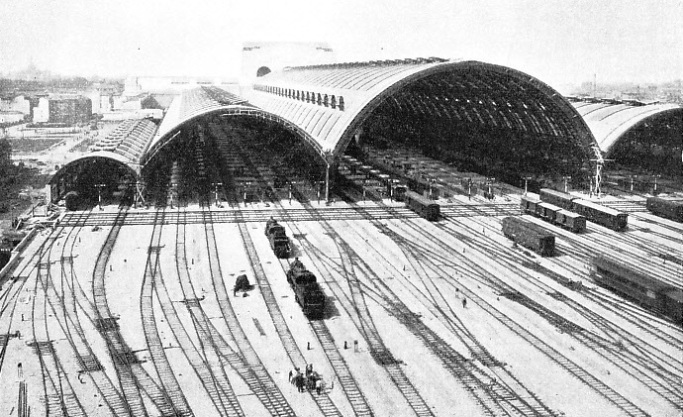 The expenditure involved by the construction of Milan Station and the reorganization of the railway services, including the Locomotive Depot at Greco and the marshalling yard at Lambrate, amounted to about one thousand million lire, which, at the present rate of exchange, would be equivalent to over seventeen million pounds. UNDER CONSTRUCTION. A remarkable photograph taken of the roof of the station while it was being built. The completed roof covers an area of 80,000 square yards. The ingenious method of raising two sections simultaneously by two sheer-legs is illustrated in this picture. You can read more on “Modern Construction in Italy”, “The Rome Express” and “The Rome-Naples Direttissima” on this website.